Interlace, Knots, Spirals, Crosses, Key Patterns, Zoomorphic Images. Notice the Celtic Interlace Designs. The designs created by ancient Celts, both on the Continent of Europe and on the islands of Britain and Ireland, are typically characterized by two-dimensional graphics, featuring the use of complex patterns based on a number of recurring motifs. These motifs include knots, zoomorphic imagery, interlace patterns, spirals, and crosses, and appear on a wide variety of artifacts and artworks including monumental stonework (eg. the Turoe Stone), phalerae, coins, precious metalwork, personal ornaments and jewellery. 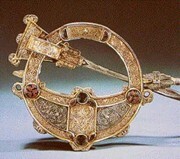 During the early Christian era, Celtic style designs were widely employed in the creation of illuminated manuscripts and high cross ring sculpture. In their heyday of the 3rd and 4th centuries BCE, the Celts straddled the whole continent of Europe, from the Baltic to the Mediterranean, and from the Back Sea to the Atlantic. As a result, Celtic art and design of this period, known as the La Tene style, drew on a huge range of artistic traditions, from the Balkans, the Greeks, the Etruscans, the Romans, the Egyptians and many others. 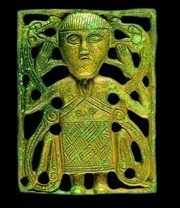 During the later Christian period (5th-10th century CE), Celtic artists and metalworkers drew upon motifs, techniques and stylistic forms from Anglo-Saxon and Germanic artists, as well as Christian figurative imagery. This combination, known as Ultimate La Tene, Insular Art or Hiberno-Saxon Art, introduced the Golden Age in the history of Irish Art. Originating from the Caucasus region, Celtic culture was carried by migrating tribes into the Upper Danube area of Austria, from where it eventually spread (c.600-100 BCE) into the river valleys of the Rhine and Rhone waterways, and thence south-east into Etruria and the Balkans, south-west into Spain and the Ibererian peninsula, and west into Britain and Ireland. Archeologists and anthropologists have identified two early forms of Celtic design: Hallstatt and La Tene. Hallstatt designs were used primarily to ornament high quality iron weaponry, equestrian items, along with some personal objects. Hallstatt motifs included bird shapes, possibly derived from early Etruscan art, other animal designs (zoomorphs), plus numerous abstract geometric patterns including knotwork and fretwork, but few plant patterns. Symmetry was important, thus figures were frequently arranged in pairs. La Tene designs was influenced by wider trading contacts between Celts and other peoples within the Mediterranean area, including the Etruscans, Romans, Macedonians, Greeks and Carthaginians. Thus formal motifs were imported from Greek art, early Roman art and the Black Sea area, but Celtic metalworkers quickly evolved their own unique interpretations of abstract flowing patterns. The result was a highly stylized form of curvilinear art, based mainly on vegetable and foliage imagery, together with spirals, triskels, and trumpet shapes. The range of geometric decoration was expanded to include cross motifs, cross-hatch, herring-bone, concentric circles and others. As the power of Rome reached its zenith in the 1st century CE, most Continental Celts were absorbed and integrated into the Romanized territories of Gaul, Spain and others. Only on the island territories of Britain (partly) and Ireland (wholly) did the pagan Celtic design tradition survive unhindered in what is called Ultimate La Tene, Insular Art, or Hiberno-Anglo-Saxon Art. This form of art was an abstract style, characterized by a horror vacui (a horror of empty space), and thus featured dense patterns of abstract configurations or stylized arrangements of animals. Figurative narratives were also created, notably on Irish Celtic High Crosses of the 9th and 10th centuries CE. Celtic designs incorporating knotwork, spirals and other curvilinear styles, were in no sense original - many other early cultures had been utilizing such motifs for centuries. For instance, the renowned stone engravings at the Neolithic Passage Tomb at Newgrange (Dún Fhearghusa), part of the world famous Brú na Bóinne complex in County Meath and created some 2000 years before the appearance of the Celts, included numerous spiral patterns. However, it is fair to say that Celtic designers breathed new life into these existing patterns, making them more complex and sophisticated in the process, and thus turned them into a distinctive and recognizable feature of Celtic art. The Celts were a pagan people who converted to Christianity from about the 5th century CE onwards. Even so, their characteristic designwork did not disappear following their conversion. On the contrary, the heritage and traditions of Celtic art were fully absorbed by the new generations of scribes, metalworkers and sculptors patronized by the growing Christian Church, particularly in the monasteries and scriptoriums of Ireland, Iona, and Northern England. In this art, scrollwork remained a vital decorative element, but during the 7th century, filigree casting, die-stamping of decorative foils, gilding and granulation methods were borrowed by Celtic craftsmen from the Germanic world and, with these, they produced dazzling and highly colourful work. This fusion of Christian, Celtic and Germanic motifs can be seen throughout the illuminated gospel texts, ecclesistical objects and freestanding high cross sculpture of the early Christian Insular period (c.600-1100 CE). The oldest symbols associated with the Celts are spirals. Engraved on ancient pagan stonework, spiral patterns (including the triskele, or the triskelion) are another quintessential feature of ancient Celtic art. Common Celtic zoomorphs feature birds and snakes, although images of hounds, horses, deer, lions and boars are also used, along with numerous imaginary animals often in grotesque forms, including part-human, part beast. Zoomorphs appear regularly in the illuminated Gospel text, the Book of Kells, in which each of the four evangelists are allocated an animal symbol: the man for Matthew, the lion for Mark, the calf for Luke and the eagle for John. See also, the fine decorative work in Christ's Monogram Page in the Book of Kells. There are eight basic types of knot from which nearly all the interlaced patterns in Celtic decorative art derive. Two of these are derived from a three-cord plait, the remaining six from a four-cord plait. Knotwork appears in many different types of Celtic art, including metalwork as well as the illuminated biblical texts, in which certain figures are drawn with complex knotted hair. (This type of Celtic design was later absorbed by Art Nouveau artists in the 1890s.) Knots were also seen as having spiritual significance: for instance, when creating these knot-patterns on personal artifacts, designers believed that each crossed line provided added protection to the wearer. For an example of this interlace designwork see the carpet pages in the famous Book of Durrow. Possibly derived from the early Coptic church, the pagan Celtic cross is made up of a regular cross with a ring centred on the intersection. When Christianity spread to Ireland and Britain, the pagan Celtic cross was combined with the Christian cross (scholars believe that St. Patrick sought to exploit symbols that the Irish were already familiar with), as exemplified by the ubiquitous Medieval Christian High Crosses of Ireland (eg. The Muiredach Celtic Cross, County Louth). These became popular during the Insular Art period (c.650-1100 CE) and typically consisted of straight lines making up intricate, blockish designs, sometimes described as "square spirals". Due to the widely dispersed settlement of Celtic tribes across Europe, traditional Celt artifacts are located in some of the best art museums and heritage centres throughout the Continent, as well as in Ireland and the United Kingdom. Here is a small selection of venues whose collections contain examples of Celtic design: you can search some of their online collections for more images of Celtic art.  For more on the history of Celtic designs (Interlace, Knots, Spirals, Crosses), see: Visual Arts Encyclopedia.